I felt honored when M. K. Tod offered me the chance to read the prelease of her latest historical fiction novel, Time and Regret. I’ve been following M. K. Tod’s blog, A Writer of History, for several years. In the crowded blogosphere I have found hers so dependably useful that it is one of only a few blogs I read faithfully. Having never read her fiction, I began with anticipation and hope that it would meet my expectations. I was not disappointed. In Time and Regret Ms. Tod weaves parallel tales from WWI and the 1990s into a mystery, a memoir and a love story. Her writing produces a visceral experience of WWI horrors — the brutality and futility of the freezing, muddy trenches — and leads you through the protagonist’s journey of love lost and love found. The work is well crafted in plot and prose, unfolding the juxtaposition of the past with the present and entwining connections from one to the other. Stuck in VA for extra days due to endless rain, I figured it was a great time to venture into my freebie. The work is right around novella size and I finished it in four evenings. 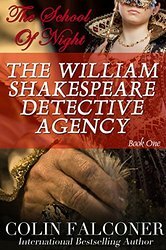 The story introduces country bumpkin William Shakespeare, cousin to THE William Shakespeare. Country Will has come to London to seek his fortune and landed on famous Will’s threshold penniless. Of course, he gets into immediate trouble and raucous fun ensues. I don’t write starred or formal reviews, but I will say this was good entertainment: rough-and-tumble London, complete with murder mystery and forbidden romance. It is a bit bawdy, but then, so is our famous Shakespeare at times, when we high-brow readers are willing to admit it. The main character is endearing, famous Will is well fleshed-out and the romantic interest has pizazz. Mr. Falconer is setting himself up with plenty of material for future escapades. The second installment – The William Detective Agency: The Dark Lady – has also been published. I confess, I’m easy pickings for London, theatre history and Shakespeare, but I’m sure anyone looking for a few evenings of escape to into Elizabethan England will enjoy it. The author’s historical notes at the end are particularly amusing. Falconer has written these as if commenting on the historicity of the story as a found document/journal and notes various anachronisms or “poor memory” by the original “author”. Clever. You can see Amazon reviews here. Colin Falconer’s Blog is here.